The Chevie Diner Booth Set represents a fully upholstered booth featuring a “V” shape Headroll with 11 vertical channels at 4 inch centers. This beautiful booth is offered in your choice of two colors of vinyl. This very popular retro booth was designed to evoke a 50’s nostalgia for the vintage auto. As priced, the set is comprised of two 24″D x 36″H x 44″L benches with a coordinating 24″ x 42″ diner table and Classic Chrome Column Base. Designed and made in the USA – Commercial Quality and built to last! 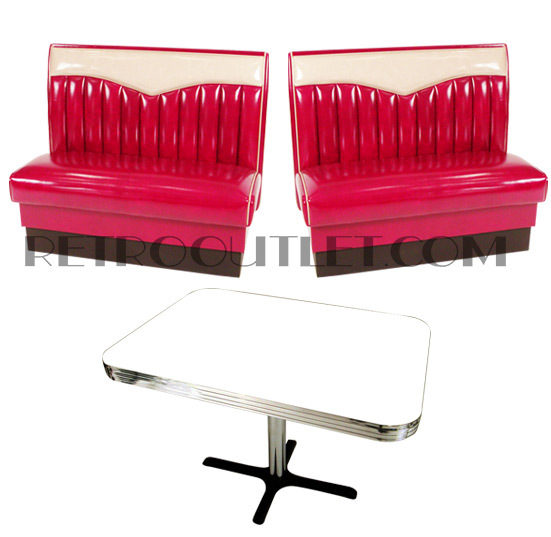 Please allow 4-5 weeks for production of your Diner Booth Set in your color selections.